There may be some photographs of a rather festive mug included. Just warning in case my delayed catch-up of festive makes upsets your idea of seasonally appropriate makes. 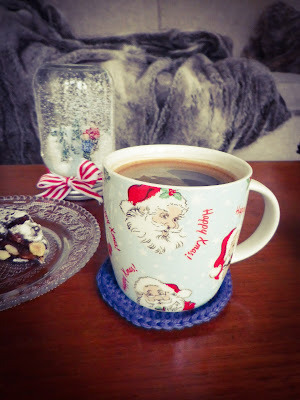 Again, I could have got away with it's winter so am embracing the hygge feel...if it wasn't for the Father Christmas mug. Oh well. I should also mention that this isn't the last of the festive catch-ups - more to come and there may even be a twinkling Christmas tree in the background. Sorry. Hope you are enjoying lots of steaming mugs on your wooly coasters, Linda and Ems! I had to do lots of Christmas Catch Up posts! I am enjoying this look back over some recent makes this morn with my coffee! Gosh, I still have some wooly makes to show. As they are a few shawls, hope they're not too seasonally inappropriate - I'm still making good use of a snug shawl in May. 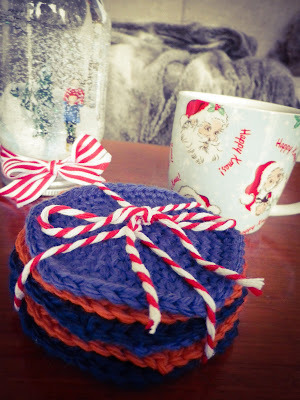 I quite fancy some crochet coasters, maybe in some summery colours... I shall add to the list!